 This RC model is not a toy and is not suitable for children under 14 years old, keep it away from children. 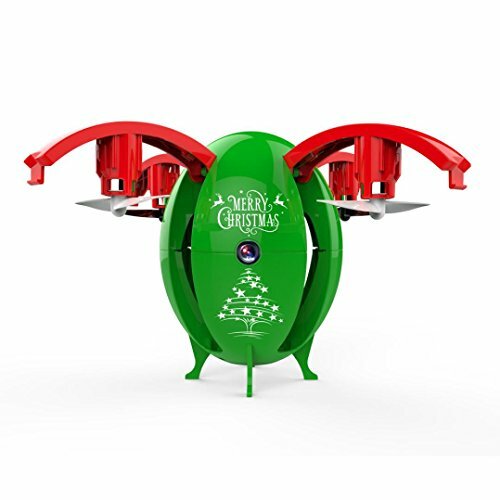  Egg Pocket Drone- A cool Christmas gift for children  With transformable egg appearance, novel and unique, it will give you a special look. A wonderful gift!  One button take off / landing function: avoid lost aircraft and bring drone back with the simple push of a button.  Altitude hold mode makes it easier to control the drone for beginner and more stable for aerial photography.  Headless mode: Completely solving "loss of orientation" problems.  One key to return: It can find its way home easily, reducing your fear of losing it.  Equipped with LED light, the drone will shine in the darkness which is good to show you the right flying direction.